Mountain View, Calif. February 9, 2017  Last year was a breakout year for Quotient Technology Inc (NYSE: QUOT), as the company further expanded its retail network and added tens of millions of registered shoppers to its ranks. 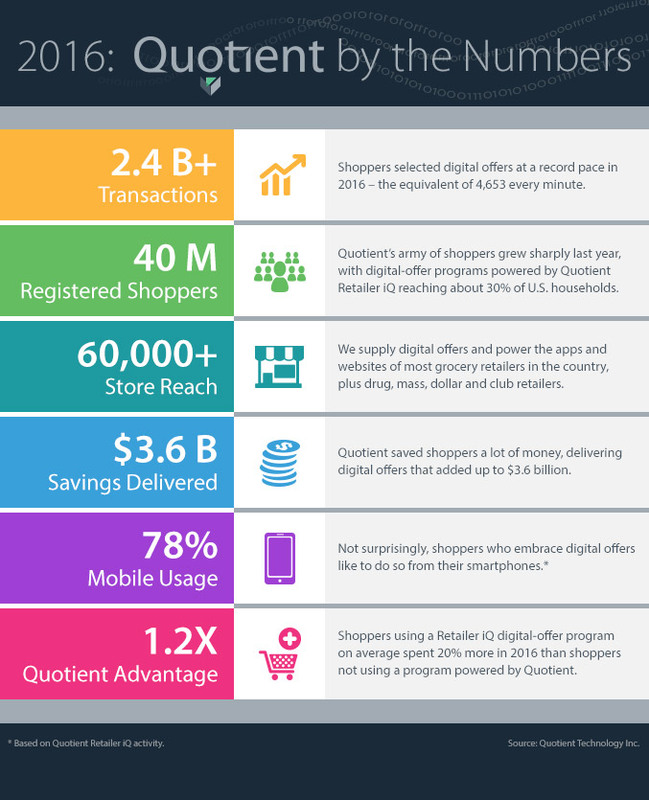 Quotient ended the year with about 40 million registered shoppers – people who save through the many retailer apps powered by the Quotient Retailer iQ platform, which analyzes a mix of in-store and online data to deliver relevant promotions and media messages. (This doesn’t include the millions of people who save via the Coupons.com app and website). Shoppers selected more than 2.4 billion digital offers last year – a 48% jump from 2015. 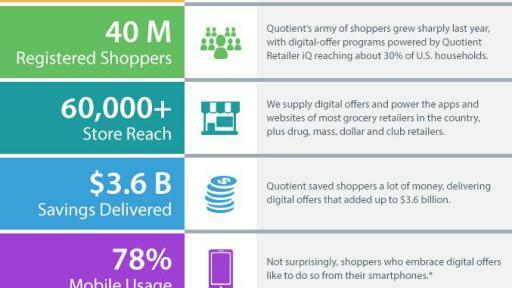 In the past five years alone, Quotient has delivered more than 7.9 billion digital offers. The upshot: Working with its consumer packaged goods (CPG) clients and retail partners, Quotient has amassed an army of engaged shoppers that brands and retailers can influence – and mobilize – on short notice. Ultimately, everyone wins: Consumers save; CPGs and retailers drive sales. To learn more about Quotient, please fill out the form below and someone will be in contact with you shortly.